The co-creator and editor of locally based Geez is celebrating the magazine’s 20th issue and fifth anniversary this winter, and sees Winnipeg as a socially conscious place for a magazine to help create a community for those who may feel isolated otherwise. James Patterson, publisher of the magazine that explores faith and social issues with a critical lens, finds relevance between the magazine and its readers, which makes it stand out among competitors. Patterson, also the associate publisher for Canadian Dimension magazine, believes the emphasis should be on the reader and the community, rather than the magazine itself, to create resonance. Canadian Dimension’s second annual “Red” Carpet Gala Awards Dinner and Fundraiser that took place this month, hosted by the 47-year-old magazine, is a perfect example, according to Patterson. Winnipeg Women magazine has been celebrating strong women for over 10 years, creating a well-established relationship with readers. “Like any relationship, you build it on trust,” said Glenn Tinley, publisher for Studio Group Media, who publishes Winnipeg Women. Tinley thinks this relationship attracts advertisers to the magazine. “People don’t advertise in the magazine because we write a story about their company – they want to advertise in the magazine because readers care about the content,” he said. “Winnipeg is a small market, so when we talk to brand agencies in Toronto, so many times we’re told Winnipeg is too small – or straight out: ‘We don’t care about Winnipeg,’” Tinley said. According to Geez, one of their greatest successes is that they are an ad-free, not-for-profit magazine. For Enns, the dream is to remain that way, but he admits the reality of maintaining a business sometimes means making exceptions. 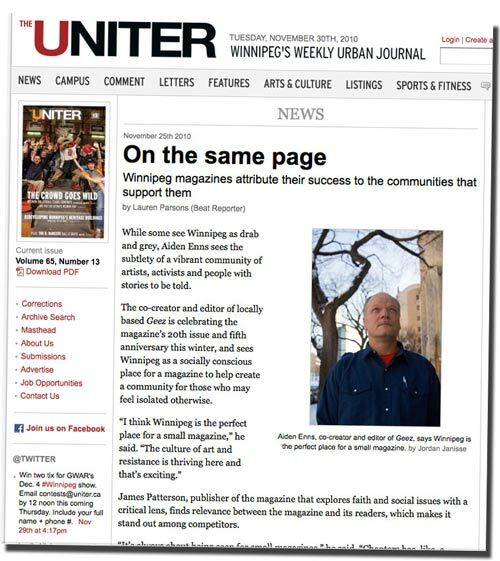 All three magazines are written and published in Winnipeg, and show no sign of disappearing. In fact, the trio are growing in popularity through tools like podcasts, video components and online subscriptions. “The companies who adapt over the next three to seven years will be the ones around for at least the next fifteen – and that’s where we’re heading,” Tinley predicted.